A ceiling is the surface that covers the upper limit of a room. It is not generally considered a structural element, as it does not hold anything up. It simply conceals the underside of the floor or roof above it. There are many different types of ceilings in architecture. In religious buildings, the ceilings are often decorated with frescos, mosaic tiles and other surface treatments. 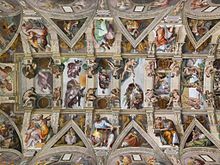 Perhaps the most famous example is the ceiling of the Sistine Chapel, painted by Michelangelo. The Simple English Wiktionary has a definition for: ceiling. This page was last changed on 22 October 2013, at 03:24.